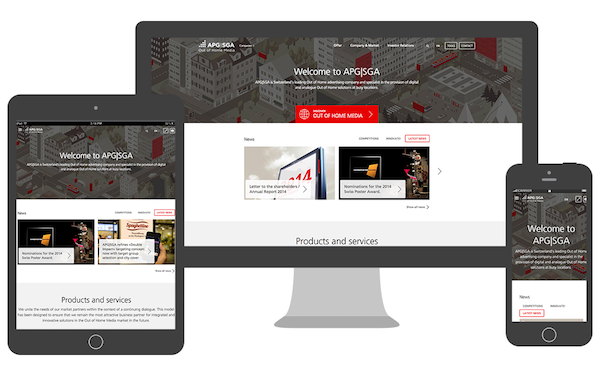 The APG|SGA websites was developed with a coherent and meaningful visual design language. This serves to unify not only aesthetic presentation but the presentation of information expressed through it as well. Thanks to the many features and advantages provided by django CMS, the new sites have returned immediate, quantifiable value, directly attributable to improved usability and new interactive tools, including a 12% increase in return visits and a stunning 75% increase in mobile users. Building the website with django CMS contributed to significantly increase usability without compromising usefulness for three target audiences - advertising professionals, agency staff and the general public - by overhauling the information architecture of all APG|SGA group websites. Content and navigation have been simplified and streamlined and menus improved, with a series of techniques addressing all levels of information design. Content has been re-organised and re-structured, removing duplication and reducing the discovery burden upon visitors. The new sites prioritise accessibility and optimise performance, offering a better user experience to more users and encouraging more exploration of the group's services, tools and promotions. The redeveloped websites have brought the client immediate, quantifiable value, directly attributable to improved usability and the new interactive tools. This includes a 12% increase in returning visitors: customers and potential customers for whom the new sites are worth more of their time and attention. Tablet sessions increased by 33%, while mobile users showed a stunning 75% increase.